It all comes down to the potential on offer at one of the world’s top undeveloped high-grade zinc-silver-lead-gold-copper volcanogenic massive sulphide (VMS) projects in Alaska. 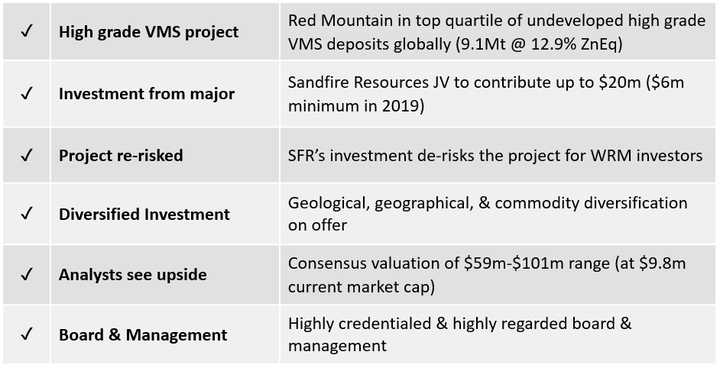 Even for a company of its size — Sandfire is capped at $1.1 billion — this early stage, yet globally significant, Red Mountain VMS project is an extremely attractive prospect. The project already has a Maiden Resource base of 16.7Mt at 8.9% zinc equivalent across two deposits, including a high-grade component of 9.1Mt at 12.9% zinc equivalent, and a newly discovered massive sulphide mineralisation. This $20+ million investment from Sandfire is extremely encouraging and solidifies my view that the project has some serious potential. Sandfire knows what it takes to transition from being an ASX junior to a major player, and has extensive experience in taking greenfield projects from a blank canvas to a multi-million-dollar cash machine. Consider that ten years ago, Sandfire had only just scratched the surface in gaining an understanding of the geological features of the area in Western Australia that now hosts one of the premier, high-grade copper mines in the Asia-Pacific region, the DeGrussa Copper-Gold Mine. DeGrussa’s remarkable progress from discovery drill-hole to first production spanned just over three years and set new benchmarks for the efficient development of resources in WA. So Sandfire is clearly getting something right. And management’s experience in developing multi-commodity projects will be of great assistance given that the Alaskan project in question is rich in zinc, silver, gold and lead. Sandfire’s investment of up to $20 million over four years may deliver it a 51% interest in the project. This is significant, as the project, Red Mountain, is currently 100%-owned and operated by a company that’s capped at just $8.1 million. That company is White Rock Minerals (ASX:WRM), and along with the Red Mountain zinc and precious metals project in Alaska, WRM has the Mount Carrington gold and silver project in NSW. Clearly there’s some value that’s not being recognised by the market. The recently signed Joint Venture agreement between White Rock Minerals (ASX:WRM) and Sandfire Resources (ASX:SFR) will see the highly profitable $1.1 billion capped Sandfire, invest up to US$14.4 million (A$20m) in WRM over the first four years. Sandfire can then increase its interest to 70% by sole-funding a further $10 million and to deliver a positive Pre-Feasibility Study with an Ore Reserve within a further two years. WRM can contribute at 30% to retain its interest. Fortunately for early stage investors, market capitalisations can be misleading as to the real value of a company. Consider that less than six months ago broker, Baillieu Holst, attributed a base case valuation of $22.8 million to WRM’s Mount Carrington gold silver project in NSW alone. Mount Carrington has been the subject of a pre-feasibility study (PFS) that indicated it has capacity to generate first stage free cash flow of $37 million, with potential for production to start by 2021. Further still, the stronger gold price and a falling Australian dollar since the PFS, would see the free cash flow in the model rise from $37 million to around $58 million. Despite the strengths of WRM’s Australian project, the Alaskan Red Mountain VMS project is shaping up so well that management is focusing its efforts largely on identifying just how large and transformational this project could be. WRM and Sandfire first linked up in July 2018, during WRM’s initial exploration program at its 100% owned Red Mountain Project. The relationship involved Sandfire providing $2.5 million in equity for the opportunity to enter into a JV with WRM in relation to Red Mountain. This has resulted in Sandfire being a strategic cornerstone shareholder in White Rock with 12.7% — a great endorsement on the potential of the Red Mountain Project. Sandfire also provided an unsecured $1 million convertible loan to WRM in 2018. This has since been converted to count towards Sandfire’s minimum spend contribution in 2019 as a part of Stage One of the JV agreement. However, Sandfire’s latest show of support, as detailed below, is by far the most material. Sandfire management has demonstrated its willingness to support the project from a financial perspective and make a long term commitment, indicative of its understanding of the work that goes into developing large-scale projects. Stage 1: Sandfire to fund a total of $20 million over four years to earn 51%, with a minimum expenditure by Sandfire of $6 million in year one. Stage 2: Sandfire to fund a further $10 million and deliver a pre-feasibility study (PFS) over an additional two years to earn 70%. Stage 3: WRM may opt to contribute to the JV. If not, Sandfire can fund Stage 3 alone to earn 80% by completion of a definitive feasibility study. Stage 4: WRM may again opt to contribute to the JV. If not, Sandfire will earn 90% and WRM’s 10% interest will be earned from project cash flow. The JV will see WRM benefit from Sandfire’s significant technical expertise and its strategic support as the company moves to unlock the potential from its large strategic land holding at the Red Mountain Project. Part of Sandfire’s success can be attributed to the group’s ability to identify promising assets outside of its own portfolio at an early stage. It has a record of teaming up with smaller companies to assist in exploration and development. This was exemplified by a JV negotiated with Talisman Mining Ltd (ASX:TLM) in 2013 and Sandfire’s acquisition of the company’s Springfield project in October 2018. By this stage Sandfire had increased its stake in the project to 70% in a staged agreement similar to that planned with WRM. Final consideration was $72.3 million, while TLM was capped at just $13.8 million when the JV was established. Six months later, its market cap had more than doubled to $29 million, and by December 2015 it hit $73 million. The agreement was based on Sandfire spending a minimum of $15 million on exploration over a 5.5 year period – sound like a familiar scenario? Consequently, there is the potential for WRM to experience a similar sharp lift in its market capitalisation, especially as it has tripled the Red Mountain project area through the staking of an additional 524 new State of Alaska Mining Claims and Mineral Locations. During the highly successful 2018 exploration program, White Rock undertook field mapping and sampling on a broad regional scale. The results were the catalyst for the company to expand its strategic tenement holding to take in more of what has been identified as a highly prospective geological setting. Underlining the strength of the relationship with Sandfire, WRM consulted the group prior to embarking on its tenement expansion. The majority of the expanded tenement area forms a contiguous block of mining claims that now extend the Red Mountain project over a larger area of the Bonnifield Mining district, to the west along strike and south into the prospective footwall identified as containing multiple VMS prospective time horizons. 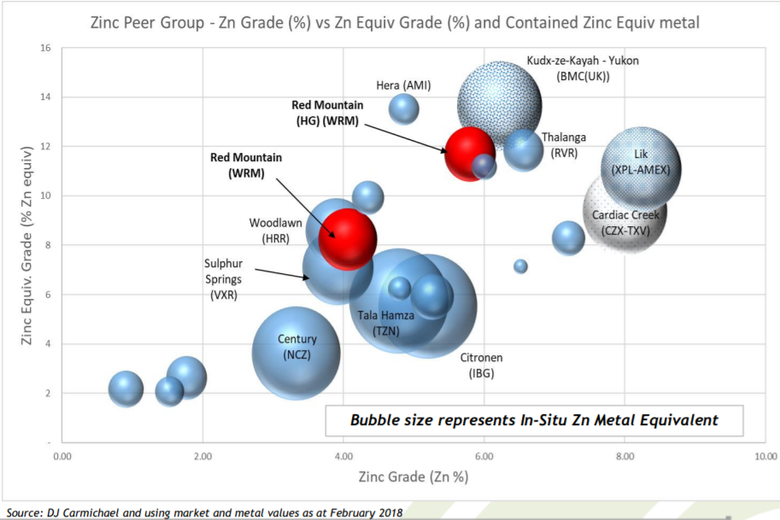 The new claim areas will allow White Rock to systematically explore what is now held to be a highly prospective setting capable of hosting multiple high grade zinc-rich polymetallic VMS deposits. 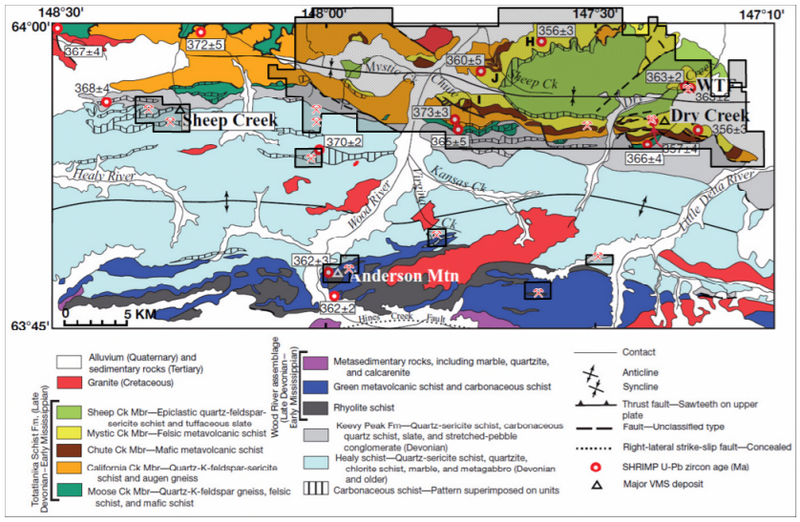 The following map outlines the new tenements which generally lie south south-west of the Dry Creek and West Tundra Flats deposits, as well as the Hunter prospect which has returned outstanding rock chip assays. The Hunter prospect was in fact a greenfields discovery made by White Rock’s team on the ground. 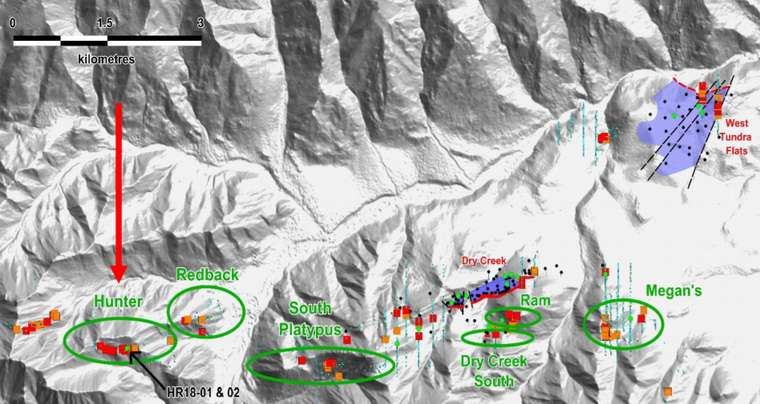 The first two drill holes, which featured outcropping on surface, was open for at least 500 metres along strike and open down dip, intersected between 1.4m and 1.8m at grades up to 17% zinc, 3.9% lead, 90 g/t silver and 1.6% copper. As WRM prepares to embark on its 2019 exploration program, it is worth looking at the building blocks that were established in 2018. These will provide perspective as drilling results come to hand from both extension drilling and the exploration of new targets identified in the course of mapping and sampling, and conducting detailed geochem and geophysics, during the latter part of the 2018 exploration program. 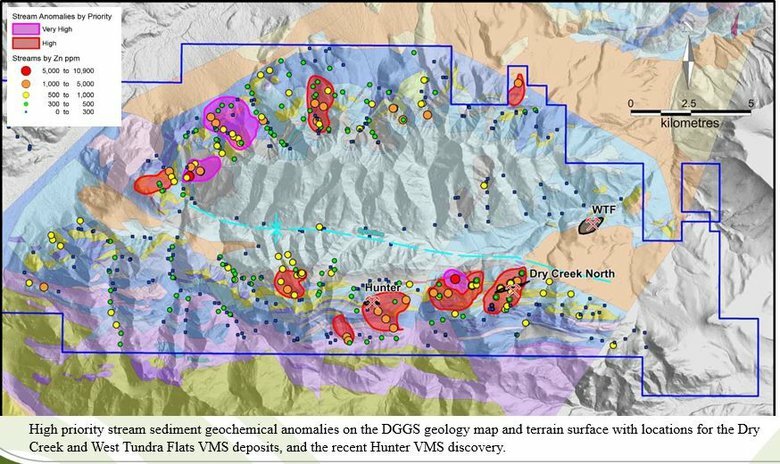 The program featured a new VMS discovery at the Hunter prospect where the extent of outcropping sulphides was confirmed with assays from diamond drill holes returning intercepts with zinc equivalent grades of 25.8% and 19.5%. However, the exploration success extended to other areas where the company was undertaking extensive drilling, and the following map points to some of the areas that yielded strong returns. A summary of these drill intersections can be found in the company’s latest financial report. WRM compares very well against other companies targeting similar mineralisation. In fact, the Red Mountain Project emerges in the top quartile of undeveloped high grade VMS (zinc, silver, gold) deposits globally. That’s reason in itself to sit up and take notice, yet equally important is the fact that there are limited opportunities in zinc production and project development assets on the ASX. This is particularly the case if looking for a highly scalable project. 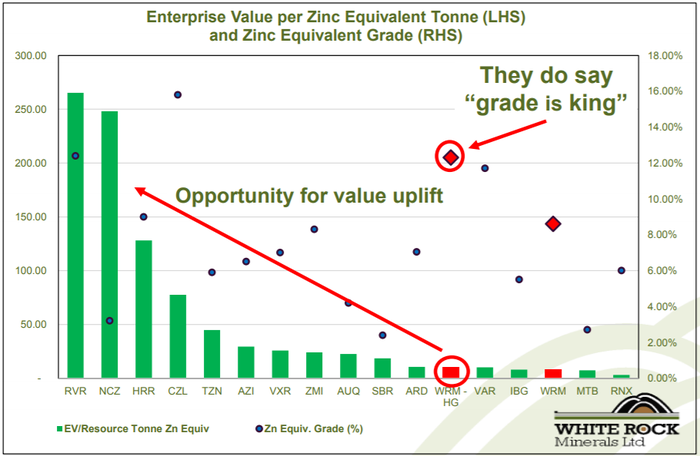 The following graphic underlines WRM’s particularly high zinc equivalent grades and the discount that it is trading at when compared to its peers. A range of analysts have put pen to paper in arriving at a company valuation that better reflects the value of the company’s assets, and these are their findings. As was the case with the pre-feasibility study at Mount Carrington, the Australian dollar gold price that was used to calculate these figures was substantially lower, indicating that the above valuations would be upgraded at today’s price. Albeit, they are speculative valuations and may not eventuate. In short, the company is overdue for a share price rise which would bring its market cap more in kilter with its peers. And with Sandfire’s involvement there’s all the more reason for recognition of WRM’s metrics when compared to its peers.